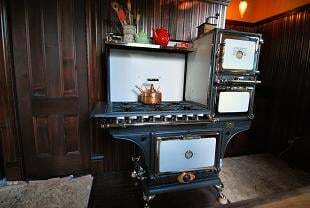 Kim and Roy Fox, clients of mine, are in the home stretch of restoring their Victorian kitchen. You can read more about their story in two previous blog entries. Kim and Roy wanted to capture the beauty and elegance that was often historically reflected in the butler’s pantry. They chose a natural wood finish, soap stone counter top and back splash, and an absolutely wonderful early mixer faucet. Kim needed to have a functional work area sooner rather than later, so the emphasis was placed on completion of the lower cabinets so she would have a functional sink and dishwasher (camping is fun for a while, but there are limits….). We all want them, even if we don’t admit it… Dishwashers, yes indeed! Kim and Roy wanted to incorporate a hidden dishwasher, and I recommended a Fisher & Paykel. One of the most challenging aspects, however, is that the control panel happens to be on the front of the drawer. The panel had to be recessed into the wood and then covered with an antique pull handle that was just the right size. It is completely hidden, but still accessible for operating the dishwasher. The carpenter, Brandon, was able to create false drawer fronts that make the dishwasher completely indistinguishable from the bank of real drawers on the right side of the sink! Yep, dishwashers, we want them, but we don’t want to look at them! The first stove that Kim and Roy purchased was not well restored. They ended up sending it back, but not sure where to locate a well restored replacement. I recommended Dave Erickson of Erickson’s Stoves in Littleton Massachusetts. It seemed like the best thing to do was for Kim and Roy to go to New England, meet Dave, and see if he had a stove for them. Dave had so many choices, that Kim and Roy almost came home with two stoves! But alas, with only one kitchen they ended up choosing this lovely Eriez stove that has eight burners, two small ovens and one large oven. It is all gas and electric, so no need to tend the fire and clean the ash box here! They had it in time for Thanksgiving, and it worked beautifully, as Dave’s stoves always do. To the right of the stove, they have a utility sink. The sink is copper, with a more plain wooden cabinet, soapstone counter top, and vintage separate hot and cold faucets. The sink is copper, with a more plain wooden cabinet, soapstone counter top, and vintage separate hot and cold faucets. Kim has an enamel tin cup and stand in the corner at the ready! Kim needed storage, but in an unfitted kitchen there just isn’t much. The storage is usually in the pantry. So Matthew Roman and I came up with a bank of upper and lower cabinets that were designed to look like the old dish dressers commonly found in butler’s pantries. Kim wanted a wooden counter top, and chose a contrasting wood finish, which reflects light into the room. The upper cabinets will have etched glass fronts when they are finished. Kim will actually end up with more storage with her new old kitchen than she had with the contemporary kitchen that was removed… Fancy that! Although Matthew was not able to be with us when this photo was taken, Kim, Roy and Karla posed for a group shot in the pantry. Between them is the kitchen plan. A beautifully finished light fixture is above the utility sink. Note the lovely bullet shade, and wonderful pull chain lever. There is great attention to detail that takes time, but Roy and Kim are now in the home stretch to having a wonderfully restored Victorian Kitchen.